Need a great gift for a new feeder? Then I highly recommend the Spuds Seedling Gift Set from the online store: For Your Bug-a-Boo! 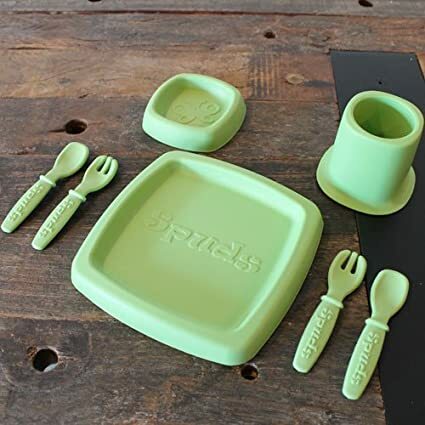 This set includes an open plate, small bowl/plate, cup and utensil set. It is a great starter set for yourself or a friend! The greatest part about it is that it is made from all natural, non GMO, reclaimed potatoes. No potatoes are grown for Spudmer. Rather it is based on a side stream potato starch of the potato processing industry. Spuds takes the leftovers from factories that make French fries, tater tots, and chips and creates a biodegradable bio-resin. Only non GMO potatoes are used. All Spuds products are biodegradable, made with the first ever organic color. No leaching chemicals! Spuds products do not leach or migrate toxic chemicals into food source. Spuds products are solutions to the growing concern over toxic chemicals leaching from children's products before, during and after key developmental stages. Spuds developed a vegetable (potato) based biodegradable, bio-plastic solution called Spudmer. Spuds diverts the waste away from the water supply, saves water and industrial waste. No potatoes are grown for Spuds, and Spuds does not compete with world food sources. It comes beautifully packaged in a wooden gift box perfect for gift giving and is available in 3 colors.